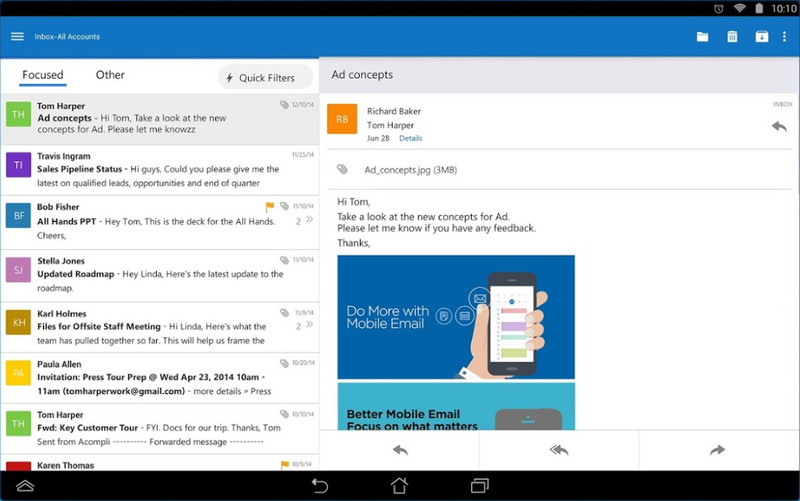 Microsoft Outlook is a free email app which brings together your emails, calendar and contacts from all your accounts. The app works with Microsoft Exchange, Office 365, Outlook.com, iCloud, Gmail, Yahoo! Mail and iMap, and can attach files directly from your email, OneDrive or Dropbox. The core functionality just works (only the most important emails make it to your inbox, there's a built-in calendar, you're automatically notified of appointments). You'll still find plenty to do, but Outlook keeps the hassles to a minimum. You can quickly filter mail to find unread items, locate anything with attachments, maybe list messages from your most frequent contacts, in a tap or with a few letters. Processing emails (delete, wipe) just takes a swipe, or you can schedule emails and they'll reappear to be dealt with later. The Outlook app is still relatively basic, but for an early release of a free app, it's a good start. And the rapid pace of development suggests it could be really impressive, quite soon.